Or you could call this when a pantser tries to plot. I used to be a pantser, or, really, a hybrid. With Promise and Purpose, I let the characters tell me the story, but I had an idea of where it was going and some of the major plot twists. I kept a notebook with scribbles so I wouldn’t forget my ideas when the time came. I had to blur it up so you didn’t see any spoilers. Also, note my reward for figuring this out. It’s gone now. It tasted yummy. This is the second half of the book. It looks like a huge mess, I know. But you know what? That’s exactly what I needed. Although what’s on this page is basically spread out on three pages elsewhere in nice, linear format and narration, I guess I had to see the pieces all together and how they fed each other. 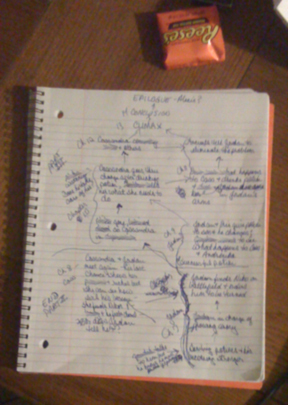 This mess is kind of a mash-up of earlier note-scribbling-pantsing days and my more recent foray into outlining. I don’t know. It works. And that’s what we writers have to do with every single story we sit down to write. As I’ve learned, a successful method for one book might not be the right one for the next. Have you ever had to turn your ways upside-down and inside-out? Or have you been able to find a single tried-and-true method that works for you? Do you ever get pages of notes that look like mine? Or worse? I do have worse. Maybe we can have a blog fest for messiest notes and outlines. So far, my tried-and-true method has worked and I haven’t had to stray. My notes start out as a total mess and somehow manage to turn into a readable outline. Along the way there are many, many, many doodles of settings and characters. But I’m pretty sure your notes are messier than mine. So far. i’m still looking. feels elusive right now. still worrying about what everyone thinks. d***. hoping to get there soon but i can’t force it. d*** again. I’m just random so haven’t come up with a tried and true method yet. Never know what I’ll be doing next. I love it! I have a notebook that looks very much like yours. I always say I’m a pantser, but I suppose I’m a hybrid too. It’s funny, today I was thinking that I know everything that happens in my WIP and maybe I should make an outline. It scared me, because then I felt like I would have to commit. Even though I know what’s going to happen and it would help to organize my thoughts, not to mention my desk. Sheenah, It sounds like you have something that works for you. I wish I could doodle characters and settings. Stick figures just don’t inspire me. Dawn, So your style is random – what a fun style! 😀 As long as it works, who cares?! Stacey, Here’s how I talked myself into outlining: Have you ever read a book where you knew what was going to happen but you kept reading because you knew WHAT would happen, but not HOW? You don’t have to commit to an outline. Surprise scenes and dialog will still pop up. But if you’re having a problem keeping your thoughts straight, it might help. I’m not saying you should or shouldn’t do anything one or the other. Method is a personal thing. But if that’s your fear and you really do want to outline, maybe you can overcome it. Holla if you want help!